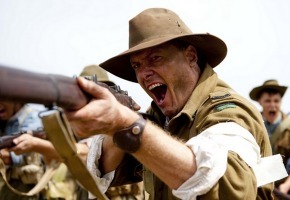 Next Tuesday night ABC begins a 4 part docu-drama The War That Changed Us that brings to life six distinctly-different Australian experiences of WWI. Foot soldier Archie Barwick (Myles Pollard) from Tasmania; army nurse Kit McNaughton (Jane Watt) from southwest Victoria; Boer war veteran Harold ‘Pompey’ Elliott (Luke Hewitt) from Melbourne; English born, farm labourer’s son Tom Barker (Tom Milton); peace campaigner, Vida Goldstein (Virginia Gay) and pro-war crusader Eva Hughes (Alexandra Jones). The War That Changed Us uses dramatic reconstruction, location filming, expert analysis and colourised black and white archive to tell a gripping tale spanning three continents over four brutal years. The events of 1914-18 not only changed the course of human history, but would also test the mettle of one of the world’s newest nations – Australia. 8:30pm Tuesday August 19 ABC.